On 5-11-12, the A-coil on our air conditioner went out. We called our appliance insurance company. They contacted York Heating and Air and they were out that afternoon. On 5-14-12, the next business day, York Heating and Air came out to get more information and faxed their findings to the insurance company. The insurance company wanted a second opinion, so we had to put York Heating and Air on hold. 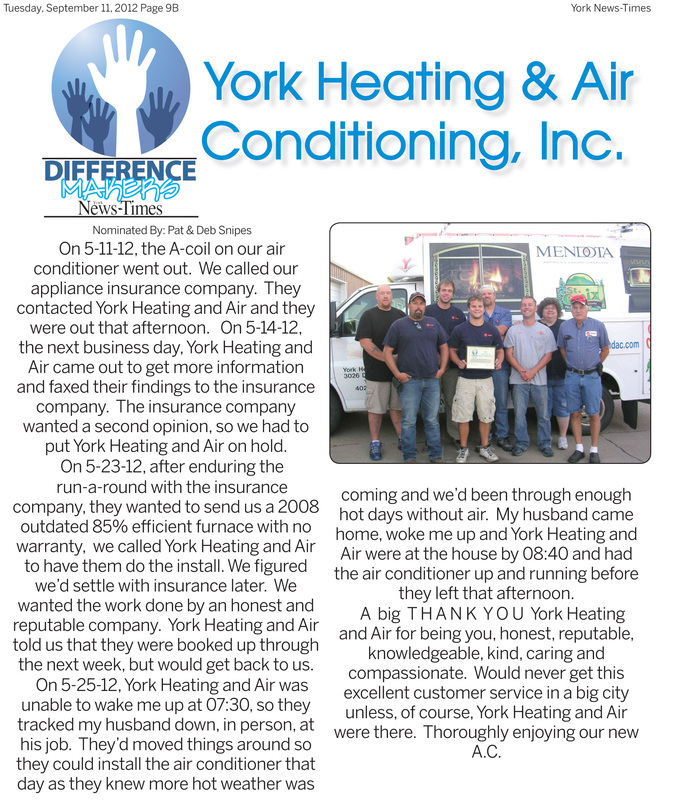 On 5-23-12, after enduring the run-a-round with the insurance company, they wanted to send us a 2008 outdated 85% efficient furnace with no warranty, we called York Heating and Air to have them do the install. We figured we’d settle with insurance later. We wanted the work done by an honest and reputable company. York Heating and Air told us that they were booked up through the next week, but would get back to us. On 5-25-12, York Heating and Air was unable to wake me up at 07:30, so they tracked my husband down, in person, at his job. They’d moved things around so they could install the air conditioner that day as they knew more hot weather was coming and we’d been through enough hot days without air. My husband came home, woke me up and York Heating and Air were at the house by 08:40 and had the air conditioner up and running before they left that afternoon. A big T H A N K Y O U York Heating and Air for being you, honest, reputable, knowledgeable, kind, caring and compassionate. Would never get this excellent customer service in a big city unless, of course, York Heating and Air were there. Thoroughly enjoying our new A.C.